By 2100, vegetation patterns will be shifting in almost half the land area of the planet, according to new research in the journal Global and Planetary Change. Song Feng of the University of Arkansas in the U.S. and colleagues in Nebraska, China and South Korea have taken a long cool look at what the projected patterns of warming are likely to do to the planet’s mosaic of climate types. And they predict dramatic changes. Climate type is a century-old idea useful for making sense of geographical zones: regions are grouped according to the type of vegetation they support. 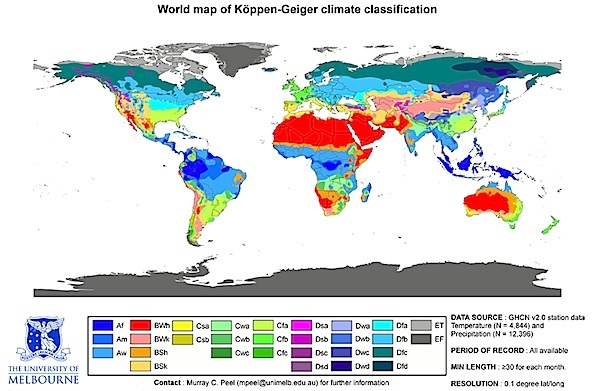 Since a global map of native vegetation types can also deliver useful information about altitude, rainfall, soil type, prevailing weather and latitude, geographers regard the Köppen-Geiger classification —and an updated version known as Köppen-Trewartha—as a helpful way of describing the world. What speed are we talking about? Feng and his colleagues decided to see what projected changes in temperature would do to climate types. He wasn’t the first to do so; scientists from the U.S. National Oceanic and Atmospheric Administration reported in 2013 in Nature Climate Change on the probable speed of change in such zones. But science advances by challenge and replication, and the Arkansas team began looking for themselves at the details of simulated change under the notorious “business as usual scenario”—the one in which global fossil fuel use continues to increase and higher levels of carbon dioxide and other greenhouse gases concentrate in the atmosphere. The Intergovernmental Panel on Climate Change has made a series of predictions of rising global average temperatures, but plants, of course, don’t care about global average temperatures: they are however distinctly vulnerable to local extremes of frost and heat. The Feng scenario projected an increase of between three degrees Celsius and 10 degrees Celsius; the team analyzed observations made between 1900 and 2010, and then ran computer simulations from 1900 to 2100. In the last three decades of the twenty-first century, for instance, northern winter temperatures are likely to rise by between three degrees and 12 degrees Celsius; Arctic coastal temperatures are likely to rise by eight degrees Celsius; warming in mid-latitudes is likely to be between five degrees Celsius and seven degrees Celsius, the tropics and the southern hemisphere around five degrees Celsius. The Arctic will shrink. Sub-polar vegetation is expected to advance by five degrees of latitude and the temperate zones will push northwards too. Arid and semi-arid climate zones are expected to expand by somewhere between 3.3 and 6.6 million square kilometers in the last three decades of this century. In the south-western U.S. higher temperatures and drier conditions could lead to more forest fires, and pest outbreaks could lead to changes in forest structure and composition. As the plants change, the animal species that evolved with the vegetation types could be increasingly at risk. Altogether, up to 46.3 percent of the planet’s land area could shift to warmer or drier climate types.